The Clear Lake Fire Department dedicated a memorial last night that includes a piece of salvaged steel from the wreckage of New York City’s World Trade Center. The steel beam now sits on a reinforced concrete base wrapped in slabs of granite with water flowing on rocks around the base. Clear Lake Fire Chief Doug Meyers says the outpouring of support for the project has been tremendous. He says firefighters from several area communities came to the ceremony, including from Clive and Urbandale, as the Clear Lake department was able to get a piece of steel for them, too. He says the turnout and support from the community for the memorial and the construction of the new fire station has “been awesome.” Shortly after the unveiling ceremony last night, Meyers says people were enjoying the finished product. He says they tried to take ideas from what the public submitted and work with those since there were requirements that the public must be able to “interact” with the steel beam 24 hours a day. Meyers says the placement of the memorial is in a spot where people can drive by and see it on a daily basis. He says there’s parking close by so people can get out of their cars and walk just a few feet to touch the beam. He says other similar memorials around the country haven’t been that accessible and they wanted to make sure it was easily reached. Meyers says they want people to stop by and interact with the memorial. He says the opportunity for people to witness this first-hand is incredibly important and they wanted to make it so people didn’t have to call anybody to get access to it. 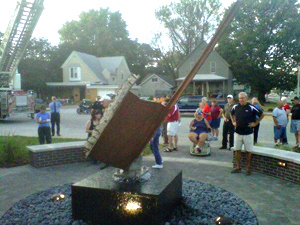 The memorial is located in front of the fire station at the corner of North 8th Street and 2nd Avenue North.